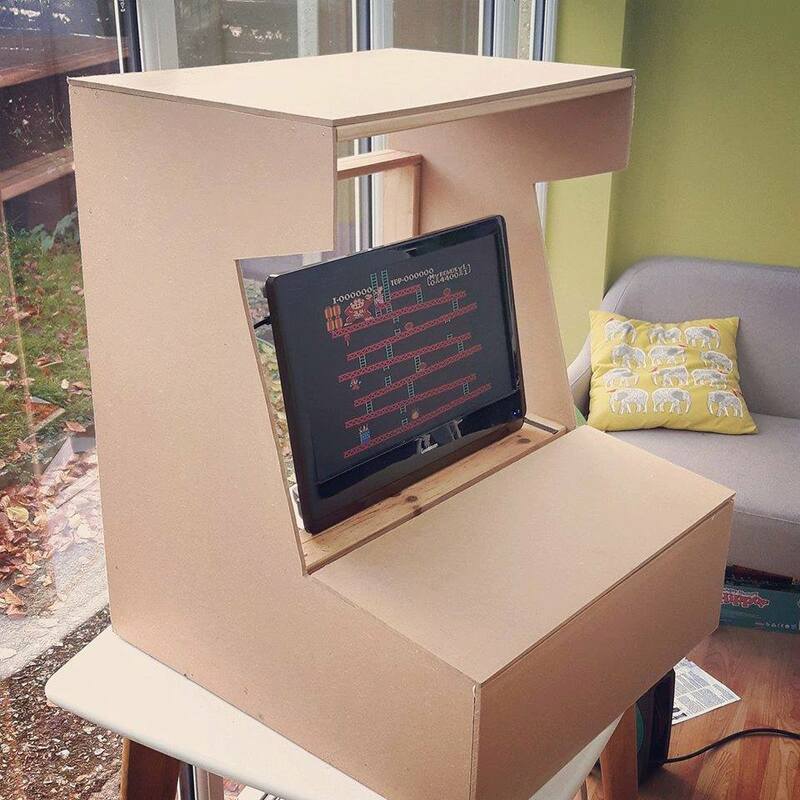 Here is the arcade cabinet, powered by a tiny Raspberry Pi Zero in its finished state and I really like the way it turned out. I’ve learnt a great deal during the build process and will be in a better position should I take on a similar build. Although the whole build came in at around £40 (not including the screen), I have learnt that it is worth investing in decent materials to finish off the look of the cabinet. When trying to work out how to cover the frame cheaply, I actually put the question to a couple of online forums and a number of people suggested self adhesive car vinyl and so this is what I went with. It turned out to be a very wise choice as it’s durable, easy to apply without trapping any air bubbles and does a really good job of hiding any woodworking mistakes. The red edging is simply insulation tape but I think I can find a better alternative. If you’re considering building your own cabinet but are put off by taking that initial step, I would definitely giving it a try. If I can do it then so can you. 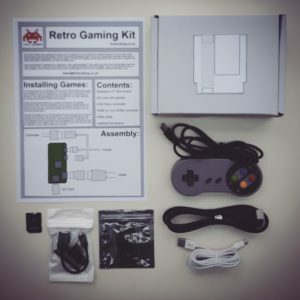 We sell raspberry Pi retro gaming kits in our shop here which will get you started. This was my favourite stage of the build as I now had a working model. It was nice to play the cabinet in its entirety as it highlighted a few faults, the main one being the width. Although the dimensions of the cabinet are all based around the screen I’m using, it all feels a little excessive for a single player set up. I’m now regretting not making the cabinet dual control – Next time! Here is a short video of the cabinet in a working state. Although the Retro Gaming Pi Kit comes with a USB controller, this wasn’t ideal for the arcade cabinet. 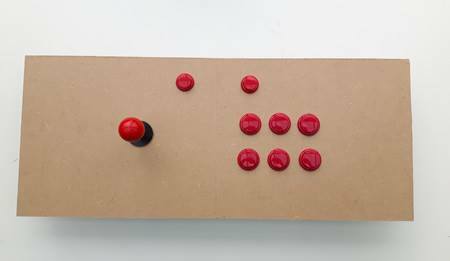 The hunt was on for a set of USB arcade buttons and joystick as this will still work with the the Raspberry Pi and a quick search on eBay revealed a set for the nice price of £10. The milling out of the holes for the buttons was easy to do though the next step of crimping the connectors was a struggle with the type of pliers used. Still, the button wires fed nicely into the USB board which was hot glued to the underside of the MDF panel. If you’re having trouble with the wiring then check out this helpful USB Arcade Controller Wiring Guide. I’ve learnt the hard way that it’s good practice to test as much as you can during any build and after connecting up the new controller panel, it all worked first time. Playing the classics with a controller is one thing but replaying them how they were originally intended, with a joystick and buttons really transforms your gaming experience. The gaming cabinet is being built without any plans and this is going to make for an interesting project indeed. All dimensions for the cabinet are being based around the screen that’s going to be fitted inside and from here I was able to cut out the basic shape for the sides of the cabinet. It got easier moving forward, joining the two sides with more MDF board cut to measurements based around the TV screen and before long the cabinet soon started to take shape. I’ve never been good at woodwork but will always give things a try. I found this part of the project a little frustrating as the lines I cut weren’t as neat as I had hoped but I should be able to hide a few mistakes when I come to cover the cabinet and add the graphics. Still it’s nice to see some reward for my efforts even at this early stage. Check out First Coding’s Retro Gaming starter Kit here. I love retro gaming, my collection of old consoles will testify to that but there has always been one thing that I’ve never had the opportunity to own due to the ever increasing price tags they carry – the arcade cabinet. So a challenge was been set to build a low cost arcade cabinet that will be based around a kit similar to the components of First Coding’s Retro Gaming kit. 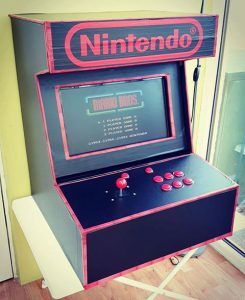 The kit contains a Raspberry Pi Zero which will be perfect and the SD card provided runs Retropie with arcade games already loaded onto it, so it is perfect for a project such as this and a great build to kick this blog off. Be sure to follow the cabinet’s progress here on the First Coding blog.